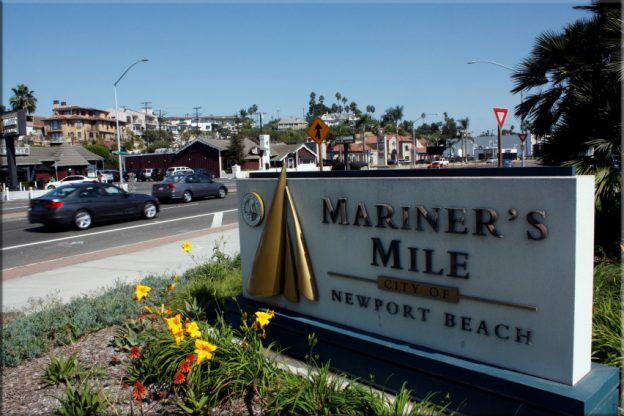 Latest news: The Planning Commission’s recommendation to the City Council about City staff’s proposed “Mariners’ Mile Revitalization Master Plan,” which had been expected to come on May 18, was been re-scheduled for July 20. However, on July 18, City staff issued a statement saying they were “withdrawing” the Plan from consideration. Apparently it may return as part of the proposed citywide General Plan Update, or after the latter is completed. Meanwhile, the “Mariners Mile Hwy Configuration/Land Use Review” budget item (project ID No. 15T06), dating back to the FY2014-15 budget, remains, with $90,631 of residual funding, in the Capital Improvement Program component of the City’s FY2017-18 budget. That account appears to be the one used to fund the “revitalization” efforts. The proposed CIP also includes a “re-budget” of $49,944 toward the City’s long-delayed reconfiguration of the Old Newport/PCH intersection (see Recent Events, May 5, 2017, below). That budget item was approved as part of the larger budget at the Council’s June 13 meeting. Overview: According to the City’s website, Mariners Mile (oddly spelled Mariners’ in the proposed new Master Plan despite existing road signs to the contrary) has been identified as an area needing revitalization. With completion of a study evaluating roadway capacity requirements for West Coast Highway, the City is evaluating existing land use policies and regulations, which it says may inhibit “revitalization” of the area. The “Mariners’ Mile Revitalization Master Plan” is ostensibly intended to identify potential refinements and barriers to revitalizing the area. Why We’re Watching: The City contracted with PlaceWorks in May of 2016 to assist in these efforts. According to the City, the plan they develop will provide an implementation strategy to improve the area. But PlaceWorks is the same outside consulting firm (and in this case the same principal consultant) that coordinated the City meetings that led to 2014’s ill-conceived Measure Y. PlaceWorks also prepared the environmental analysis for Uptown Newport and the recently rejected Museum House high-rise residential development project. PlaceWorks’ odd decision to change the spelling of Mariners Mile from Mariner’s to Mariners’ seems indicative for their general disregard for the existing Mariner’s Mile Strategic Vision and Design Framework adopted, after considerable effort, in 2000. Concern about the outside planners’ disconnect with the history and spirit of the place is exacerbated by the fact that a good portion of Mariners Mile (the so-called “Haskell/Ardell properties” and the adjacent Duffy Boat sales/rental office) has recently changed hands and will likely be the subject of major projects and proposals. As residents, we expect these projects and proposals to adhere to our General Plan rules in order to avoid spot zoning exceptions which pave the way for excessive heights and density. And as residents, we need to raise these concerns during the earliest phases of project planning. Opportunity to Join Voices with Other Concerned Citizens: A group of residents, business people and business property owners, concerned about recent City planning decisions affecting Mariners Mile and the future direction of the new “revitalization” effort, including the renewed push to widen Coast Highway, has banded together as the Coalition to Protect Mariner’s Mile. The group is completely independent of SPON, but has chosen to associate with SPON for purposes of tax-deductible fundraising. The Coalition hopes to increase citizen awareness of and influence over the City’s current planning effort and future planning decisions affecting Mariners Mile. On May 5, 2017, the Coalition launched a website which articulates their efforts and concerns. Visit it for further information, including an opportunity to sign their petition of concern, volunteer your time or make a financial contribution. July 20, 2017: The hearing, originally scheduled for May 18, has been re-scheduled to July 20. The Planning Commission was expected to make a recommendation about the Plan to the City Council, but the Mariners Mile item was removed from the agenda at the last moment. The Plan is now in limbo. June 13, 2017: Council approves continued budget for the “Mariners Mile Hwy Configuration/Land Use Review” item (project ID No. 15T06), dating back to the FY2014-15 budget. $90,631 of residual funding remains in the Capital Improvement Program component of the City’s FY2017-18 budget. That account appears to be the one used to fund the “revitalization” efforts. The proposed CIP also includes a “re-budget” of $49,944 toward the City’s long-delayed reconfiguration of the Old Newport/PCH intersection (see Recent Events, May 5, 2017, below). This “re-budget” item was approved as part of the larger budget at the Council’s June 13 meeting. June 5, 2017: Last day to submit comments on Caltrans’ environmental study of their Arches Intersection improvement proposal. See May 5, 2017, below. Planning Commission Recommendation on “Master Plan” (May 18, 2017): A formal hearing before the Planning Commission was expected on May 18, at the end of which City staff expected the Commission to make a recommendation to the City Council about the proposed Revitalization Master Plan. However, that meeting was cancelled. The matter will apparently be brought back at a later date after City staff resolves whether Commission Chair Kory Kramer can participate in the recommendation (see notes about his conflict under April 20, below). That process could apparently take anywhere from 30 to 60 days. City “Development Review Committee” (May 11, 2017): City staff’s “Development Review Committee” is expected to hold a “Pre-Application & Project Review” meeting regarding a proposal for the former Ardell Property (site of A’maree’s and the boat storage area across PCH). The meeting is not likely to be open to the public. PMM Community Awareness Event (May 6, 2017): On Saturday May 6, from 9 a.m. to 1 p.m., the Coalition to Protect Mariner’s Mile held a “Community Awareness Event” at Cliff Drive Park in the upper picnic area between Riverside and Redlands. Caltrans releases Arches Intersection plans for public comment (May 5, 2017): The City, in collaboration with Caltrans, wishes to make changes to the “Arches Intersection” where Old Newport, PCH and the Newport Blvd. bridge come together. Before proceeding with the project, Caltrans, on May 5, released the required environmental “Initial Study and Negative Declaration” for 30 days of public review and comment. This project has been in the City’s Capital Improvement Program budget since 2012 (the “FY13 CIP“) and curiously the CIP adopted in 2016 and the proposed CIP set for adoption in 2017, in which it is listed as “Old Newport Blvd/West Coast Hwy Widening (15R19),” say the design and environmental review has been “completed.” In fact, the City seems to have passed the review responsibility for this over to Caltrans. However that may be, the City’s Public Works staff has said they have been unable to obtain grant funding for this project, so its fate is uncertain even if it obtains Caltrans approval. Planning Commission study session (April 20, 2017): The Planning Commission held a study session on the Master Plan on April 20 at 6:30 p.m. in the City Council Chambers, with a minimum quorum of four Commissioners in attendance (PC Chair Kory Kramer appears to be permanently recused from this item due to his management interest in the Balboa Bay Club & Resort, Commissioners Zak and Hillgren had excused absences). The consultant made a presentations about the proposed Master Plan and City staff made one about the eventual widening of Coast Highway through Mariners Mile to six lanes. After extensive public input, the Commissioners seemed skeptical about the desirability of widening the highway and uncertain as to whether they would be able to make a positive recommendation on May 18. Staff persisted in asserting that the widening issue was separate from the Master Plan, and the latter needed to be pushed through to completion. Good Morning CdM presentation (April 13, 2017): Newport Beach Community Development Directory Kimberly Brandt and Public Works Director Dave Webb gave a reprise of their April 11 SUN presentation to a smaller Corona del Mar Chamber of Commerce breakfast group. Their presentation prompted questions, not very well answered, about the meaning and significance of a “Master Plan” and how it relates to other planning documents such as the City’s General Plan. Release of draft Master Plan (April 11, 2017): A 163 page draft of the “Mariners’ Mile Revitalization Master Plan” has been posted for public review on the City website, here. District 2 Town Hall (March 27, 2017): Mariners Mile was announced as one of several topics to be presented at a “District 2 Town Hall” conducted by Councilman Brad Avery in the Mariners Branch Library community room, and intended to inform the public of City activities impacting residents of District 2. However, discussion was largely deferred when the level of public interest proved such that Councilman Avery declared it a topic needing a meeting of its own. AutoNation Proposal Withdrawn (November 7, 2016): At its October 6 meeting, the Planning Commission recommended denial of a massive AutoNation Porsche dealership proposal, which which was not part of the revitalization planning and caught many nearby residents by surprise (see SPON video for August 18 Planning Commission meeting). Cut back into the bluff, it would have occupied the entire north side of PCH from the largely-vacant new Mariner’s Pointe building at Dover Drive to McDonald’s, with roof-top parking and elevator shafts towering 50 feet above the highway. An appeal by AutoNation was expected to be heard by the City Council at a special Monday evening meeting on November 7, 2016. However, impacted neighbors had been circulating a petition against the project and it was announced that AutoNation had withdrawn their application. The second public workshop was held as a noticed Planning Commission study session on Monday, September 26 at 6:00 pm at Marina Park. Attendance was good, despite it being a presidential election debate night. A video recording of this second Community Workshop is available here. The July 25 Community Workshop was literally standing-room only for the crowd that attended the event. It obviously attracted many more people than the organizers had planned. Attendees were split into groups and asked to share ideas for the area. A video recording of this first Community Workshop is available here. City staff has apparently been meeting with the developers and initially said it planned to submit a draft master plan to the Planning Commission in October and to the City Council by the end of the year. Sound like a rush job? The Log (August 18): Future of Mariners’ Mile redevelopment still out of focus . . .
Daily Pilot Article (July 26): Residents Share Concerns and Ideas . . .
Newport Beach Independent Article (July 29): Lively Discussion . . . The Log (June 23): Future of Mariners’ Mile Continues to be a Mystery . . .
Daily Pilot Article (January 20): Land Sale May Trigger Improvements . . . This entry was posted in Events, News, Watch List and tagged Coalition to Protect Mariners Mile, mariners mile, Master Plan, Newport Beach, Revitalization on March 20, 2017 by SPON-Karen.